We’d love your help. Let us know what’s wrong with this preview of If I Live by Terri Blackstock. To ask other readers questions about If I Live, please sign up. When will it come out in audio? Can't wait to finish this series! Dawn Leiner Just finished listening to it today. Got it on Hoopla. This series got better and better with every book! This is an excellent and pulse-pounding ending as Detective Keegan is desperate and fighting for his control. He’ll stop at nothing to shut up Casey—and Dylan. Whoever might stand in his way is standing before a raging bull, and he sees neither friend or foe in his death-throes. He takes out some unexpected folks along his way and does his level best to make sure the police force is never the same again. With such a powerful foe, how can Dylan an This series got better and better with every book! This is an excellent and pulse-pounding ending as Detective Keegan is desperate and fighting for his control. He’ll stop at nothing to shut up Casey—and Dylan. Whoever might stand in his way is standing before a raging bull, and he sees neither friend or foe in his death-throes. He takes out some unexpected folks along his way and does his level best to make sure the police force is never the same again. With such a powerful foe, how can Dylan and Casey possibly survive? It was such a delight to see Casey actually learn to trust God and to grow in her faith despite her circumstances. I loved the strong Christian message in this book, and the assurance given readers that nothing is too big for God’s sacrifice to offer forgiveness for—but that believers should be ready to count the cost as give up their sins. Don’t stop to think about how much you might wish to read the series or not. There are some rough spots in the first book, but it’s well worth bumping across them and getting lost in the survival tale as Casey runs for her life after having been accused of murdering her best friend. Though this book won’t be out until March, catch up on the first two now and make sure you have a preorder waiting for when this excellent conclusion hits the shelves. WOW. JUST... WOW. SO GOOD. How can an author maintain such a ridiculously compelling plot through three entire books? Add that awesome plot to complex characters, thought-provoking themes, and tight prose, and you end up with this amazing series conclusion. SO INTENSE. BUT STILL SO THOUGHT-PROVOKING. The author tackles tough issues of horrifying evil with hope and justice. It’s not just an incredible page-turner; it’s a story with depth and truth to it. The only downside is that the romance IS s WOW. JUST... WOW. SO GOOD. How can an author maintain such a ridiculously compelling plot through three entire books? Add that awesome plot to complex characters, thought-provoking themes, and tight prose, and you end up with this amazing series conclusion. SO INTENSE. BUT STILL SO THOUGHT-PROVOKING. The author tackles tough issues of horrifying evil with hope and justice. It’s not just an incredible page-turner; it’s a story with depth and truth to it. The only downside is that the romance IS super annoying... but I liked the overall plot enough to brush over that. All in all, If I Live blew me away. Even though the tension tied me in knots, I loved this book. But. Anyway. Review. Much of this will be spoilers, although I'll do my very, very best to avoid them. However! If you're interested in reading this book, and you see a spoiler tag, DO NOT CLICK. You will thank me. (Also I will try very hard not to spoil any of WOOOOOOOW. -Casey. Dylan. My beautiful charries. <33333333 I love them to the moon and back. -There was less travelling in this one, which was kind of my least favorite part of the other two? Less swapping phones and chucking batteries away and stealing license plates and moving from hotel to hotel. Which I appreciated. -Dylan's friend--whose name I, embarrassingly enough, cannot remember. Was it Brant? I think it was Brant or Brett or something similar. Me being me, I'm probably very, very off. If you remember, remind me because I CANNOT FOR THE LIFE OF ME REMEMBER. -The suspense! I was on the edge of my seat the entire book--I do not trust this author. Sometimes you'll be reading a book and be fairly certain your precious characters will come out okay because no one else has died. But that was not the case with this book. SO MUCH SUSPENSE. -Casey's boss (the google lawsuits guy) was hilarious. I loved him. Every series that's this intense needs some good comic relief. -OKAY HERE COME THE SPOILERS. I will try really, really hard not to bring out anything that would really destroy you if you read them anyway...but don't. SEXUAL: Not much. Again, some kissing. But this book is 100% focused on Casey and Dylan at this point so there is no sexual abuse as in the last two books, which was nice. LANGUAGE: N/A I think, although if I'm wrong, feel free to correct me. DRUGS/ETC. : The same character as before drinks a lot, which doesn't have great consequences for him. :/ I don't think there was much else. 4.5 stars and I totally recommend this wonderful Christian suspense series!!!!!!! What a great ending to the series!! I loved If I Live. There was so much suspense and danger that the pages just flew by (I barely put the book down)! I needed to know how the series would end and it was a great finale. The characters were good, same as the previous books. ;) I liked the romance story and was hoping things would work out. It actually didn't end as I thought and I loved that even more. All in all, If I Live was a wonderful read for suspense lovers. Definitely read the series in o What a great ending to the series!! I loved If I Live. There was so much suspense and danger that the pages just flew by (I barely put the book down)! I needed to know how the series would end and it was a great finale. All in all, If I Live was a wonderful read for suspense lovers. Definitely read the series in order as this is one where you need the full context. 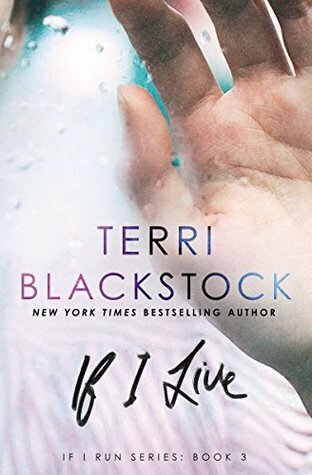 If I Live, was a wonderful, nail-biting finish to this series by Terri Blackstock. The third and final book of the If I Run series, If I Live, was the wrap-up for Casey Cox and all of the death, drama, and deception surrounding her. Again, I could not put this book down and skirted some responsibilities to finish this book. I figured seeing this case through was more exciting than folding my laundry. In all seriousness though, if you’re looking for a good mystery/crime thriller series than you nee If I Live, was a wonderful, nail-biting finish to this series by Terri Blackstock. In all seriousness though, if you’re looking for a good mystery/crime thriller series than you need to get your hands on this one. It was fantastic! I guess, for me, I feel slightly disappointed by this series. It was so hyped-up, but it just kind of fell flat for me. - The realistic characters. Casy and Dylan were smart, sensible, reasonable people for the most part - but they did have FEELINGS. They didn't fit into either stereotypical thriller character archetype: the "I'm a completely clueless jellybean" category or the "I'm so perfect and emotionless that I'm not human" category. :P I liked both of the main cha Hmmmm . . .
- The realistic characters. Casy and Dylan were smart, sensible, reasonable people for the most part - but they did have FEELINGS. They didn't fit into either stereotypical thriller character archetype: the "I'm a completely clueless jellybean" category or the "I'm so perfect and emotionless that I'm not human" category. :P I liked both of the main characters in this series for the most part! Just, uh, not together. LIKE WHY DID THEY BECOME A COUPLE?? - The intensity. WELL THEN. To say the death toll went up considerably in this book is an understatement. It was so intense. I had difficulty putting this book (or the first two in the series) down. Looooots of intense things. - The themes. It dealt with some real issues in this series. Hard things. Like abuse, grief, suicide, PTSD, etc. Yet for all the hard topics this series addressed, there was always an undercurrent of hope. A light at the end of the tunnel. A hand pointing to Jesus. It's clear that the author had no intention of making her books "empty" thrillers, but instead poignant explorations of real-life issues. - I just . . . didn't connect emotionally. I don't know. The characters were good, the plot was good, but I never felt that INVESTED in the characters emotionally. I DON'T KNOW. I'm a tough critic sometimes. I guess thriller books never really get me invested in characters all that much . . . Warning: You will not put this book down once you start reading it. You are taken on a journey and it's not one you will soon forget. It was the best of the three If I Run series. Blackstock always knows how to pull you in and make you hold on until the very end. I'm not going to give anything away, I will just let you know that it's a must read. This is a 4.5 star book and I HIGHLY recommend the whole series. The Mary Reader received this book from the publisher for review. A favorable review was no Warning: You will not put this book down once you start reading it. WOW! This book was one adrenaline rush after another. It was intense, way more intense than the first two, if you can even believe that. It was a wonderful final installment. Gut wrenching and heart pounding. I was left on the edge of my seat, wondering if certain characters would make it out of these situations alive or... well, not alive. The characters were all great. Except for the ones who weren't (*cough* Keegan), but I think that's how it was supposed to be. I loved Dex, too, just felt I sh WOW! This book was one adrenaline rush after another. It was intense, way more intense than the first two, if you can even believe that. It was a wonderful final installment. Gut wrenching and heart pounding. I was left on the edge of my seat, wondering if certain characters would make it out of these situations alive or... well, not alive. I loved Dex, too, just felt I should say that because I loved him just too darn much. My only problem I would say was that the romance felt just a little insta-lovey. Cause Dylan and Casey had barely any contact in the first two books and then suddenly they are in love with each other. But after waiting two books for them to get together, I didn't really care so that is a very minor issue, nothing at all to detract from the enjoyment of the story. I have been looking forward to reading this book, and have had it and trying to savor it, but finally gave in and consumed it, and I sure was not disappointed. We have followed these people through three books and they have become family, and I care about them. There is so much action here, and we really root against the evil in the form of the police, yes corruption at the highest, and so many innocents hurt, including the main characters. Just when you think you find someone to trust, forget it I have been looking forward to reading this book, and have had it and trying to savor it, but finally gave in and consumed it, and I sure was not disappointed. We have followed these people through three books and they have become family, and I care about them. There is so much action here, and we really root against the evil in the form of the police, yes corruption at the highest, and so many innocents hurt, including the main characters. Just when you think you find someone to trust, forget it, so sad, and scary. Surprises abound here, I could hardly believe how far the evil spread, but our hero has come a long way in her journey with God, and we know that no matter what happens she is going to be with him. You don’t want to miss this one, and do yourself a favor you won’t regret, read all three. These are awesome reads. Gripping, even from the very first line! Loved this book! Perfect ending to a highly-suspenseful series! Thrilling and fast-paced conclusion to an amazing series! Terri Blackstock delivers again! She is my favorite suspense author. In the final novel of the If I Run series, Casey Cox continues to be on the run from authorities while trying to prove her innocence. Dylan Roberts, the private investigator for the murder Casey is accused of suffers from PTSD and doesn't have the support of his family to be a civilian police officer. The pages are filled with action. The entire series was well done. My gratitude to publisher Zondervan for a complimentary copy of Terri Blackstock delivers again! She is my favorite suspense author. Absolutely. Breathtaking. I literally could not breathe while reading If I Live. The finale of the If I Run series grabbed me by the throat from the opening page until the end. And I must admit, I’m still a little uneasy and unsure if Casey will have a happily ever after. Not because I don’t think she deserves it but because Ms. Blackstock put my emotions through the ringer. I almost feel like I suffered as Casey did. I want to look over my shoulder to make sure all is well and I can truly relax Absolutely. Breathtaking. I literally could not breathe while reading If I Live. The finale of the If I Run series grabbed me by the throat from the opening page until the end. And I must admit, I’m still a little uneasy and unsure if Casey will have a happily ever after. Not because I don’t think she deserves it but because Ms. Blackstock put my emotions through the ringer. I almost feel like I suffered as Casey did. I want to look over my shoulder to make sure all is well and I can truly relax now that the series has concluded. *I received a free copy from the publisher. A review was not required and this is my own, honest opinion. I take off half a star because the romance doesn't exactly appeal to me. It was all right, but it didn't feel as deep, as real, as I... thought it should have been, I guess? I especially felt that *BIG SPOILER* (view spoiler)[their marriage at the end of the book was super rushed. I would have appreciated the romantic subplot ending by them settling into a dating relationship to get to know each other more, before they even considered getting married. (hide spoiler)] So that was a little disappointing, but it didn't bother me enough for me to bring the rating down a FULL star. December 2018 update : Listened to the audio edition (thank you, library!) practically non-stop. Even though I've read If I Live before, I was just as consumed with all the gritty twists and turns and nail-biting suspense. But this time round, what really struck me was the inspirational thread. Casey's wide-eyed wonder as a new Christian -- the way her new faith sustains her as she discovers exactly what it means to 'let go and let God'...well, it's just what I needed to hear right now. What a p December 2018 update : Listened to the audio edition (thank you, library!) practically non-stop. Even though I've read If I Live before, I was just as consumed with all the gritty twists and turns and nail-biting suspense. But this time round, what really struck me was the inspirational thread. Casey's wide-eyed wonder as a new Christian -- the way her new faith sustains her as she discovers exactly what it means to 'let go and let God'...well, it's just what I needed to hear right now. What a powerful series! I've no doubt I'll be visiting Casey and Dylan again sometime in the future...I just can't seem to stay away! I have blisters on my eyeballs from speed reading! Once you start in on this spectacular conclusion to the If I Run series you won't be able to stop until you reach the end. And when you do you will throw a tantrum (the major hissy-fit kind) because you will want more only it's all over. Done. Complete. Finis. And when the reality of that sinks in you will sulk around the house consuming copious amounts of chocolate because...well...what else is a forlorn reader to do? I don't want it to be over!!!!!! Waaahhhhh!!!! Blackstock heightens the tension in this series grand finale as characters and readers are flung willy-nilly along a twisty-turny path of epic proportion. Don't let your guard down for a second and keep a prayer on your lips for Casey and Dylan as they face evil and corruption and a psychopathic killer. My heart is still racing. And my blood pressure may never be normal again. This was a terrific finale to an excellent series! I’ve read many thrillers/suspense books in the Christian fiction subset and this series is by far, my favorite. Often I’ve found that Christian thrillers can be a bit too tame for my liking…Terri Blackstock knows how to keep it clean but also keep the reader on the edge of their seats, all while glorifying God. I read through all three of the books in this trilogy very fast…the pacing was great and the story never dragged. I loved the character d This was a terrific finale to an excellent series! I’ve read many thrillers/suspense books in the Christian fiction subset and this series is by far, my favorite. Often I’ve found that Christian thrillers can be a bit too tame for my liking…Terri Blackstock knows how to keep it clean but also keep the reader on the edge of their seats, all while glorifying God. I read through all three of the books in this trilogy very fast…the pacing was great and the story never dragged. I loved the character development throughout this book but also from the beginning of the trilogy. The faith content was incorporated perfectly into the story. I love how Terri Blackstock manages to meld thrills and suspense with a Christian message, this doesn’t seem like an easy task but she does it very well. Overall, this was my favorite of the three books in the series and one of my favorite books of 2018. I highly recommend this series to those who like adventure and thrills! So, so good! Probably my second favorite of the series. Zdecydowanie mogę dać na zakończenie tej trylogii 5 gwiazdek! Przeczytałam ją w półtora dnia, jestem zachwycona! *happy sigh* Can I give this book a kazillion stars please?!? It was sssooo good! Nothing took away my enjoyment from this book! The conclusion to the series was as awesome as the other two books. Casey and Dylan have given me some serious anxiety problems this entire series. The POV lets you get into the characters head, their thoughts are yours, their emotions are yours, and their actions became yours. Mrs.Blackstock is amazing when she writes in this POV. I just want to say I highly reccomend *happy sigh* Can I give this book a kazillion stars please?!? It was sssooo good! Nothing took away my enjoyment from this book! The conclusion to the series was as awesome as the other two books. I really loved this book, just like the others in this series. I couldn’t wait for this book to be released and when I realized it was I requested it immediately! I read it in two days despite working 19 hours in those two days and as I suspected, was sad when I turned the last page, knowing this was the last book in the series. Definitely made it on my favorites list and I recommend reading this entire series. You won’t be disappointed. 3.5 stars! What a roller coaster ride! This last book in the If I Run series was so exciting and had me turning pages as fast as I could! With the other books as well, Casey never ceases to amaze me! I loved reading about how she outsmarted the "bad guy." Multiple times! I feel like the author did a really good job wrapping up this series! She covered all the loose ends and cliff hangers from the previous two books very well! As for the romance, there was definitely more romance in this last book 3.5 stars! What a roller coaster ride! This last book in the If I Run series was so exciting and had me turning pages as fast as I could! What did bother me a little was the murder(s) that were described. I would NOT recommend this book to sensitive readers because of that reason. The villain was heartless. One of the things about this series that I liked was the Authors Note in the end of each book. She always brought it back to Gods love and grace. I think this was especially good since there were some very hard situations and topics covered. In the end, I'm so glad I read this book series! And I will definitely keep an eye out for other books by this author! This review has been hidden because it contains spoilers. To view it, click here. Oh. My. Gosh. This book was amazing and you need to read it... now... i command you. They were lit perfect from the very very beginning. Like, day one: boom! They’re in love! Okay, that’s not quite how it worked but.. Oh. My. Gosh. This book was amazing and you need to read it... now... i command you. The ending was perfect the relationships were goals this book was perfect! Tbh this series has been my fave read of 2019! Gah! This book was amazing!!!!!!! I almost want to re-read this series because I love it so much! I know officially have a new favroite author and book series. This book was an amazing conclusion to an amazing series. I recommend it to everyone, escipally people who love suspense!! I don't think I can honestly put into words how much I love this book! Guys, just read it! I know you won't regret it!!!!!! Hands down, with one personal preference blip, FIVE STARS, start to finish. Easily recommendable: Wholly believable scenario . . . Electrifying suspense . . . Heart pounding adrenaline . . . High octane action . . . Clean, yet contemporary dialogue. And I love the eerily beautiful covers; when put to together, they complete a puzzle and form a striking image. Props to the designers and artists! This series was born to thrill on the silver screen. Hollywood - you just found you Phenomenal Series! Warning: Do not pick up this book if 1) You do not have time to read (you need to lock yourself away from society for a bit) 2) if you did not read the previous 2 books (do so now!). I delayed reading this series, because it is Terri Blackstock and I knew I had to have all the books in the series before I start. Terri Blackstock exceeded my expectations with this book. It was filled with action, nail-biting suspense (at one point it felt like I was watching a thriller) and a lo I LOVED THIS SERIES! It was filled with action, nail-biting suspense (at one point it felt like I was watching a thriller) and a lot of twists (some I saw coming and others totally caught me by surprise). I did have a lot of "what, did that just happened? ", "thought so!" and "WWHHAAATT!!!" moments! And for a suspense, the Christian message and Casey's turn to God was solid and deep. Sometimes I find the Christian message in suspense a bit light, not in this one. The romance was secondary which I always love in suspense. Yes, it did feel a bit fast and the ending was a bit expected, but the story to get there was so good, I didn't even care. If you are a fan of Terri Blackstock...what are you waiting for, read this series. If you love suspense and still have to read a Terri Blackstock book, I suggest picking up this series! Oh, and I just love the covers for this series! 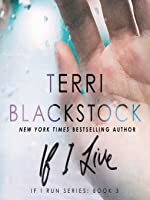 If I Live is the third and final installment in author Terri Blackstock's If I Run trilogy. As the story picks up, Casey Cox is still on the run after being indicted for murder. A murder she most definitely did not commit, but she knows who was responsible. The hunt that began with her bloody footprints escalates, and she’s running out of places to hide. Her face is all over the news, and her disguises are no longer enough. It’s only a matter of time before someone recognizes her and she ends up on the bad end of a killer who will do anything to silence her. If I Live is the final book in a trilogy, and don’t even think about reading it if you haven’t already read If I Run and If I’m Found. If I Live picks up almost exactly where If I’m Found ends, so if you’re one of those readers who has the patience to wait for the whole series before you read the first book, this series is perfect for you. Also, if you haven’t read If I Run and If I’m Found, you probably shouldn’t read this (or any) review, as they will inevitably contain spoilers about the earli If I Live is the final book in a trilogy, and don’t even think about reading it if you haven’t already read If I Run and If I’m Found. If I Live picks up almost exactly where If I’m Found ends, so if you’re one of those readers who has the patience to wait for the whole series before you read the first book, this series is perfect for you. Casey Cox is on the run again (still?) after being set up as the supposed killer of her friend, Brent Pace. Brent’s parents don’t believe Casey is responsible, so hire PI Dylan Roberts to investigate. As he tracks her through If I Run and If I’m Found, he comes to believe her story—that she’s been set up the men behind her father’s death twelve years ago. If I Live starts with a bang, as fugitive Casey narrowly escapes capture. The suspense never lets up, and there are plenty of unpredictable twists as Casey and Dylan work together to evade the police. The whole novel takes place over a matter of days, rather than the months or weeks of the previous novels. That adds to the pace. "I don't know why I didn't think of this before. I can learn so much about Christianity by listening to YouTube videos." If I Live is written in first person present tense from several points of view. I thought those choices added to the suspense, although I know some readers don’t like first person and/or present tense. If that’s you but you like a good thriller, don’t let it put you off. First person present tense can be agonising in the hands of an amateur writer, but Terri Blackstock is no amateur. Start reading, and you’ll soon forget it’s first person. Recommended for thriller and suspense fans … but only for those who read the first books first! Terri spent the first twelve years of her life traveling in a U.S. Air Force family. She lived Terri Blackstock is a New York Times best-seller, with over six million copies sold worldwide. She is the winner of two Carol Awards, a Christian Retailers Choice Award, and a Romantic Times Book Reviews Career Achievement Award, among others. She has had over twenty-five years of success as a novelist.